Renfrewshire Council has published the latest artist’s perspective of the £14.5m Johnstone town hall, work on which will commence in October following site clearance. The new civic hub will bring existing council services together under one roof and will accommodate a new library, theatre, marriage suite, conference centre and café. It will also provide a base for police Scotland and Macmillan Cancer Support. Designed by Renfrewshire Council and delivered by Holmes Miller the project is being delivered by BAM Construction via Hub West Scotland. Councillor Jim Harte, convener of the council’s sports, leisure and culture policy board, said: “Once complete, we expect the new building to provide a focal point for life in the town for years and generations to come. “As can be seen from the latest artists’ impressions, this will be a bright, modern-looking building, which we want residents to be proud of. 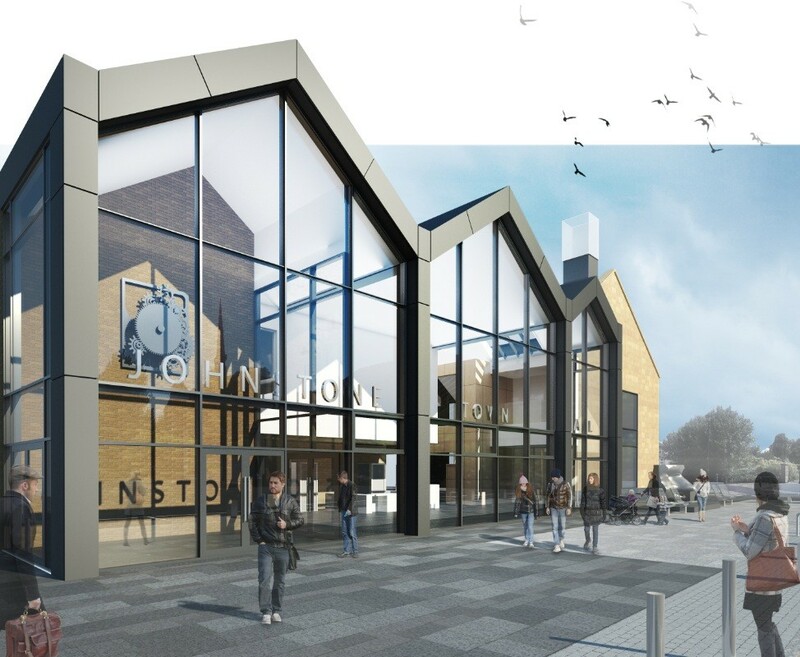 Johnstone town hall is expected to be completed by spring 2015. Interesting to see that dross such as this is reported on UR when the death of Henning Larsen, one of the finest Architects of our time appears to be completely missed! keep up the good work guys. af - for better or worse this is a significant civic investment in an area needing much more. In any event the Larsen piece is now live. That facade looks like a value-engineered version of the Transport Museam. 'That facade looks like a value-engineered version of the Transport Museam'...which in turns looks like a squashed Tesco!